Restore >> Library >> "Victory at Calvary" .. 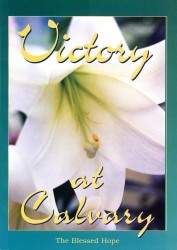 The Victory at Calvary magazine has the same contents as the "Shiloh" magazine. Only the front covers and the background color on the back cover are different. To read this magazine online, please click here. Note: The "Victory at Calvary" magazine in printed form is 16 pages, approx. 6.3" x 9".